Rome wasn’t built in a day but if you have only 1 day in Rome and you stay at Cameo B&B with our careful planning, you can hit most of the major sights and leaving time for shopping and italian food. Don’t worry about cappuccino! You will start your day with our delicious home made breakfast: pastries, toast, delicious eggs, meats and plenty of coffee. 1. Start your journey in the Vatican. Visit the Vatican Museums (of course not all of them, because it will take you too long, but do not miss the Sistine Chapel) and the St. Peter’s Basilica. 2. Pass by Castel Sant’Angelo. Cross the bridge Ponte Cavour, then take Via dei Condotti (very famous shopping street) till arriving at the Spanish Steps. 3. Go to the Trevi Fountain. 5. The Via dei Fori Imperiali leads you then to the Roman Forum and the Colosseum. 6. 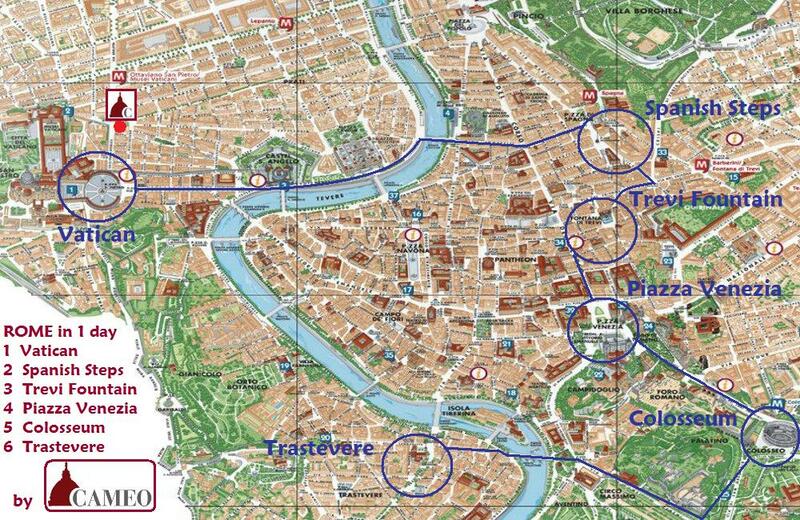 Go to Trastevere by bus and enjoy your dinner there. It’s a shame to leave so many other things off the list. Add in another day if you can!